Ultimate Library, a bespoke book curation service, agreed to share their top tips on how to decorate your bookshelves and give them a luxurious look and feel. Have you ever wondered why bookshelves in luxury hotels and libraries always look beautifully organised, colour-coordinated and noteworthy? We decided to collaborate with our long-term book curator partner and lift the veil of secrecy especially for you. 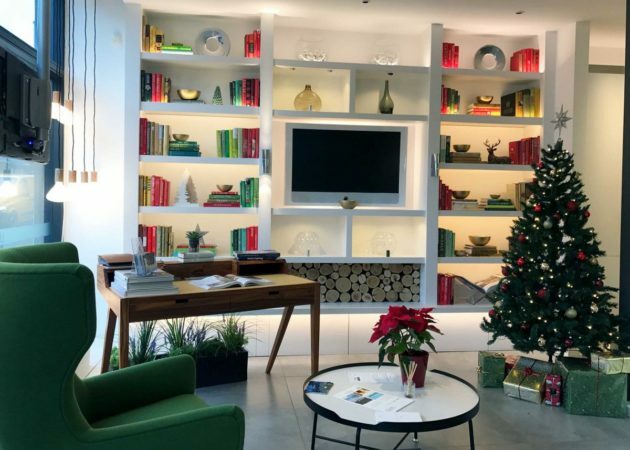 This season at John Cullen Lighting Showroom, we decided to decorate our space using golds, red and greens in order to tie the look together with the lovely furniture display provided by Dare Studio. We asked Ultimate Library to complete the look by designing a bookshelf display for us. A great advantage of using their services is that it saves you both, time and money spent on sourcing books to match your needs. Every book collection is completely tailored for each client, their interests, location and interiors they live or work in. Watch our new video to see how they put our new book collection together and find out what are their secrets on how to create a perfect decorative book display. To find out more about the importance of shelf lighting, click here.